The recovery in emerging market and developing economies (EMDEs) has stalled. Growth is predicted at 4.2 percent in 2019 with forecast downgrades reflecting external financing pressures, slowing external demand, policy uncertainty, and commodity price declines. 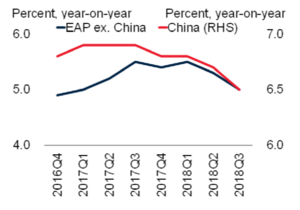 In China, activity remains robust but is decelerating, with the negative impact of trade tensions buffered by calibrated policy interventions. East Asia remains one of the world’s fastest-growing regions but growth is expected to moderate to 6 percent in 2019, assuming a moderation in global demand, and a gradual tightening of financial conditions. Growth in China is expected to slow to 6.2 percent with the rest of the region at 5.2 percent. Indonesia should hold steady at 5.2 percent, while Thailand slows to 3.8 percent. In Latin America growth is projected to advance to 1.7 percent in 2019, supported mainly by a pickup in private consumption. 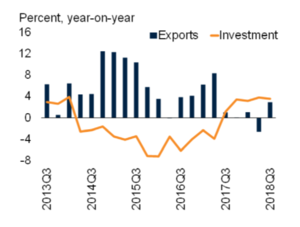 Brazil is forecast at 2.2 percent, assuming a recovery of consumption and investment, and in Mexico subdued investment is expected to keep growth at 2 percent. Growth in the Middle East & North Africa is projected to rise to 1.9 percent in 2019. 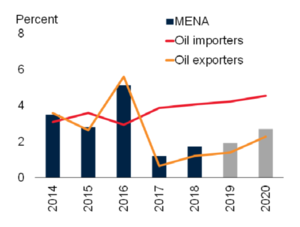 Oil exporting GCC countries will accelerate to a 2.6 percent rate and growth in Egypt is forecast to reach 5.6 percent as reforms strengthen the business climate and private consumption picks up. 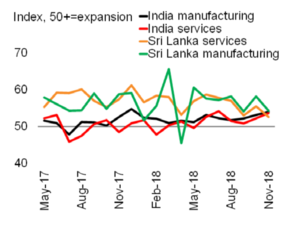 Regional growth in South Asia is expected to accelerate to 7.1 percent in 2019, underpinned by strengthening investment and robust consumption, lead by India at 7.3 percent in FY 2018/19 as consumption and investment remain robust. In Sub-Saharan Africa, growth is expected to accelerate to 3.4 percent in 2019, predicated on diminished policy uncertainty and improved investment in large economies. Growth in Nigeria is expected to rise to 2.2 percent assuming oil production will recover. In Eastern Europe & Central Asia the lingering effects of financial stress in Turkey are anticipated to weigh on regional growth, slowing it to 2.3 percent in 2019. 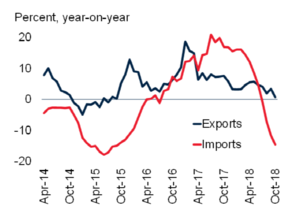 Growth in Poland is anticipated to slow to 3.9 percent dragged down by Euro Area growth and other large economies including Russia, Kazakhstan, and Ukraine are also expected to decelerate.